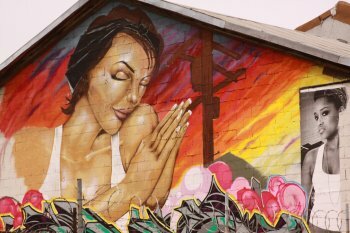 LA Gang Tours offers tours into the heart of the Los Angeles gangland territory – places you normally wouldn’t think to visit: Skid Row, South Central & Watts and Compton. This unique organization is not glorifying gang violence and activities rather they are humanizing it, raising awareness, and money to work with kids before they get sucked into this “culture’ as well as other anti-gang preventative measures. 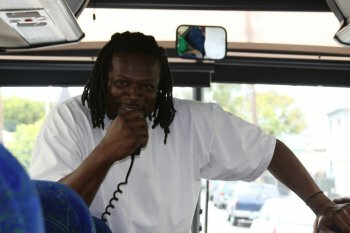 The organization was founded by former gang member Alfred Lomas in 2009 – he personally leads every 3 hour tour. The tour leaves promptly on time; Alfred told us, “our prompt departure times might have something to do with my being a bank robber in a prior life”. Alfred continued with more tongue in cheek commentary, “bullet proof vests are found under every seat, some are even Gucci or Chanel.” Nice! Guys like Fred “Scorpio” Smith and Melvin Johnson accompany Alfred on the tours. 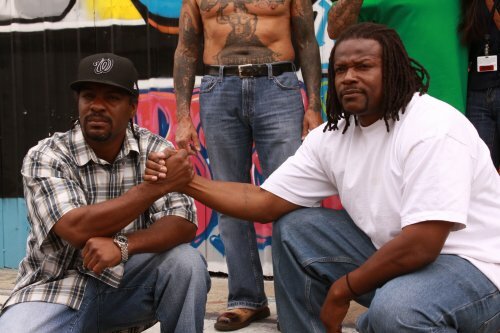 They are “OG” or “Original Gangster” and were leaders of influential gangs. Today its inspirational and touching to see rival gang leaders on the same bus together truly enjoying each others company. You start your tour at the Dream Center just north of downtown off of the 101 freeway. Almost around the corner from the Dream Center is the old Rampart Police Station – now eerily empty and looking like a relic of an earlier era. This was the scene to one of the largest police corruption scandals in US history. Over 70 officers were implicated in cover-ups, framing suspects, stealing etc and some had gang ties to South Central. Did you know there is a Federal Penitentiary right in downtown Los Angeles (Metropolitan Detention Center) – the harshness of this building and what goes on inside provides a grating contrast to the Walt Disney Concert Hall and the events held there, located mere minutes away. One of the more notorious individuals, Al Capone was housed here. A poignant stop is in front of the “twin towers” or the LA County Jail where the tour guides have all done time and some even were housed for 20+ years. Bank robberies, drug deals gone bad, murders you name it -its all here. All the guides have too many stories of when they were here. This is about a mile from City Hall and maybe 7 or 8 miles from Beverly Hills. 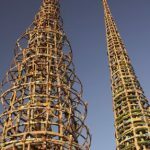 I had been to the Watts Towers before but never with former gang members. You can drive through Skid Row, South Central & Watts and Compton by yourself and not have a sense for the history that has taken place here. The former gang members are the ones who have lived this history and as a result bring the stories to life. The Watts Towers are ground central for LA Gangs. While here a ghetto bird (gang speak for helicopter) kept buzzing us – probably wondering why a group of people were wondering around Watts. The corner of Florence and Normandie in the heart of Watts is where the 1992 riots started. You will see the building that served as the command center during this time for the National Guard. Other stops include a housing project, the birthplace of the Black Panther Party and streets and areas that played vital roles for a number of gangs including the East Coast Crips (59), Grape St., Bloods, and Florencia 13 among others. Each guide will offer personal insights into their own lives, the gang culture as well as how they reformed – they will offer their stories and answer questions – this is one of the highlights of the tour. Part of the tour includes a lesson in graffiti. Words such as “tag”, “flare”, “masterpiece”, “throw-up”, and “blast ups” will have meaning once you see a few examples. 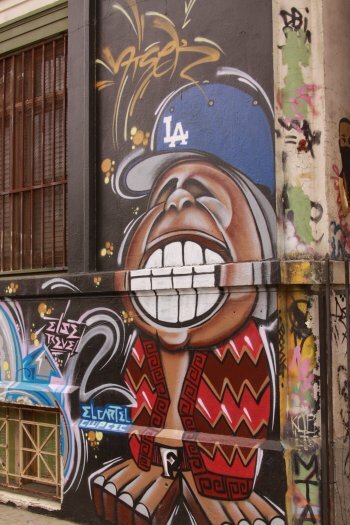 The Los Angeles River is ground central in Los Angeles for graffiti – located just south of downtown. This was also the home to the world’s largest graffiti piece, at over 2000 feet long it had a cleanup price tag of 3.7 million! The bus makes a stop here. Strip after strip of grey paint cover graffiti, a never ending and financially costly battle between street artists and the city of Los Angeles. When you stand solitary on North Main Street next to the railroad tracks above the Los Angeles River all you feel is a deep sadness as you look down on a river that has been dramatically altered in a relatively short amount of time. You look down on a dirty river that now flows dark, a concrete river juxtaposed with brightly colored graffiti where those entrapped by the city, drugs, gangs and poverty territorially cry out with their markings. 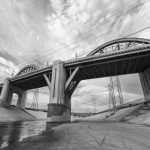 Electrical lines, bridges, rubble and old fences all decorate the banks of what was originally the lifeblood of Los Angeles. 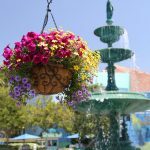 If you do not happen to be on North Main Street, any of a number of bridges in this area will afford one the same views. Close your eyes and think back 100 years to a time when this actually was a natural river, with trees and grass growing along its banks. Another graffiti stop: The Pico Union Graff Lab: www.thegrafflab.com This is a series of walls legally set aside for graffiti artists. Wall after wall of colorful graffiti has been tagged by some very talented street artists. This is also the “facebook” photo opportunity stop of the tour where the former gang members strip off their shirts to reveal a shocking collection of tattoos covering most of their upper torsos. Mention must be made about Dennis Justice and American Transportation Systems (ATS) www.amtrans.us . Dennis and his partners started with a small loan and a “prayer” a few years ago when they founded this bus company. 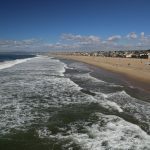 Today they offer transportation for a variety of LA tour companies, cities, local organizations as well as charter services. 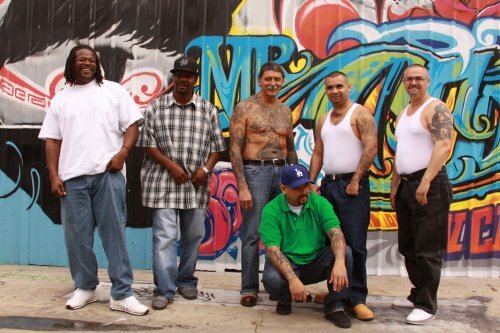 Denis truly believes in the positive work of the LA Gangland Tours and reformed Gang members. Good things are slowly happening in South Los Angeles; like anything it takes time, awareness and money. Guys like Scorpio and Melvin Johnson continue to work hard with young residents to break the cycle of violence. Scorpio teaches high school students and works on other outreach projects. On a clear day from Watts you can actually see the San Gabriel mountains rising above downtown and when you have a glimpse of nature from an urban place that has experienced so much pain, there is always hope. I would be interested in an inside perspective/tour of that type of environment. The use of his profits to help other at risk youth is more than enough reason to give it a go. Yes, the perspective on that type of life from reformed gang members is very unique indeed. It is need to experience their ‘hoods’ through their eyes and their first hand stories to. We program tours in the fevelas of Brazil in Rio and this focuses on the same those community experience tours, it’s just interesting to have them in the USA and never thought it would translate here as the same. But think about a person from Asia or South America that is under 40 and grew up watching hollywood versions of Blood and Crypt stories and rap rivelries east vs west coast. I imagine this is interesting as past bangers are touring with the respect of the current thugs withstanding. I might have missed this, but homeboy industries also is a place to reform people who are getting out of gang life. Awesome catering too. Absolutely love their salsa verde and tortilla chips. LA is amazing in that you can go from a very beautiful affluent neighborhood and not even a mile later, be in a hood. Fairfax Street is like that. There’s a stretch around LACMA that are just beautiful houses, but as you head towards Venice, it gets a little more “dangerous.” But, dangerous is a relative term. I’ve been all over this city, so places aren’t really “dangerous” to me. But, to a visitor, it may look that way. Yea, that is always interesting to me when driving around town – the immediate neighborhood changes – often within a relatively short distance of each other. I hope the street artists continue to win! Katie – yes it is a constant battle between the street artists and those removing their work. At least there is a home where they can paint w/o fear of art removal. It sounds like an interesting tour. I just returned two days ago from a mission trip where we served on Skid Row. You say that the corner of Florence and Normandie is where the 1965 riots began–I do believe that was where the 1992 riots began with the beating of truck driver, Reginald Denny. Yolanda – thanks for catching that, not sure how I missed this! I’ve just updated. Operation Healthy Streets is supposed to start next month in Skid Row – hopefully a few improvements will be made, although 3.7 million doesn’t go very far. Hahaha and I wouldn’t even be able to roll out with a shirt (insert color) without gettin beef for it. Might even catch some lead.